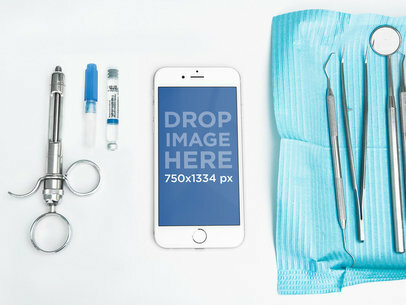 Take a look at this awesome mockup featuring an iPhone X being shown by a doctor while against a white background, it's a great image that you can use to showcase your latest app or responsive online site in a more realistic and professional way! Just drag-and-drop your screenshot image file over the interface, or capture a website's screenshot using the Screenshot from URL button. Try another iPhone X Mockup! 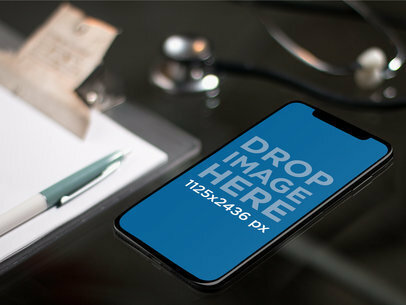 Have a look at this gorgeous iPhone X mockup lying on a doctor's office desk, near a stethoscope and a pen, it's a great choice for you to market your latest medical app in a better way! Start now, you just have to drag-and-drop your design image file over the interface or choose the Screenshot from URL button to capture a website's screenshot. Easy, wasn't it? Try another iPhone Mockup! Take a look at this beautiful visual featuring a female doctor in a hospital's ER carrying an iPhone X, it's a great option if you are looking to promote your latest app or responsive website! And it's really easy to use, all you have to do is either drag-and-drop your screenshot image file over the interface or click on Screenshot from URL. Could it get any simpler? After a couple of seconds you will see the processed image on your screen. Try another iPhone X Mockup! 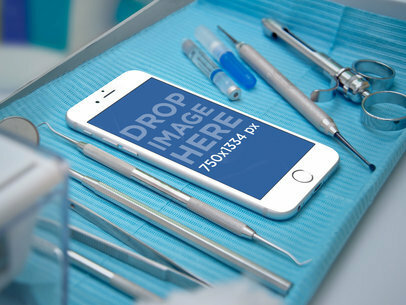 Use this awesome mockup featuring a space gray iPhone X at a dentist's desk, next to several instruments, and promote your latest app in a more beautiful and realistic way! Start now by dragging and dropping your screenshot image file over the interface or capture a website using the Screenshot from URL button. Wasn't that simple? Try another iPhone Mockup! Make a dental logo for your practice! Use this beautiful iPhone X mockup to promote your latest medical app or responsive website in a beautiful and photorealistic way! Start now, you just have to drag-and-drop your screenshot image file over the interface, or capture a website screenshot using the Screenshot from URL button. Wasn't that easy? Try another iPhone X Mockup! Take a look at this gorgeous Facebook Ad generator by Placeit, it's featuring an iPhone being held by a female doctor while at a hospital. You can use this image to promote your latest app or website in a responsive manner. Drag-and-drop your jpeg or png image file over the upload button, then edit the text fonts and colors. It's as easy as that! Now start promoting your app in a better way! Try another Facebook Ad! Medical mockups are here and ready to display your latest health app! Simply add your image over the mockup template and our mockup generator will have your download ready in no time. Create more of these incredible photo mockups in just seconds, choose from hundreds of templates and save both time and money from your app marketing strategy. Make your new iOS app stand out in this great iPad mockup featuring a medical assistant holding a white iPad Pro in portrait position. You can add your image over the placeholder now and our mockup generator will create your download in no time. See more of our digital templates in our great collection of photo mockups, you can customize more to build your own app marketing campaign! Did you make the perfect app for dentists but have no where to put it? Don&#8217;t worry, we have you covered. Your app can fit into this iPhone 6 mockup conveniently located at your local dentists office. The iPhone 6 rests on a tray of dentists tools. The tray is a reflective silver as well as the tools. You can fit an image of 750x1334px in the iPhone 6. The iPhone 6 is set to portrait view. Learn how to make a dental logo! Customize this great iPad mockup featuring a female doctor pointing to her white iPad mini in landscape position, your health app would look incredible here! Simply add an image of your app design and our mockup generator will adjust to the iPad in no time. Create all the mockups you need for your new app marketing strategy and save both time and money! Stand out with incredible photo mockups made possible by Placeit. 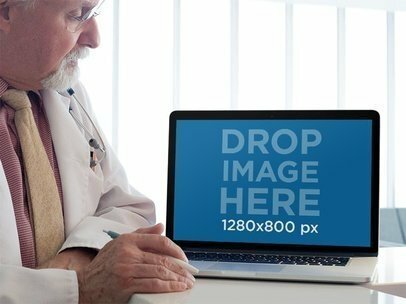 You just have to drag and drop one of your images over this template featuring a senior doctor working on his MacBook Pro, your web design will look great in it and it only takes a few seconds. Save up from your app marketing strategy and promote your app in a more appealing way with Placeit's mockup generator. If you are also wondering how to create effective banners for social media you must read Get More Ad Clicks With the Online Banner Maker It's very helpful. 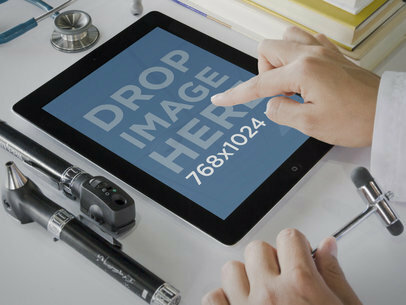 This tablet mockup features a doctor using a black iPad in portrait position at a medical clinic, use this mockup to promote your latest iOS app or website within context and create an impact on your consumer demographic, just drag and drop your image or type a URL. To see another iPad Mockup click here! Use iPad mockups to feature your latest work in a more appealing way! This mockup is the perfect asset to promote your latest iOS app, all you need to do is drag and drop your image over the placeholder now and our mockup tool will have your download ready in no time. 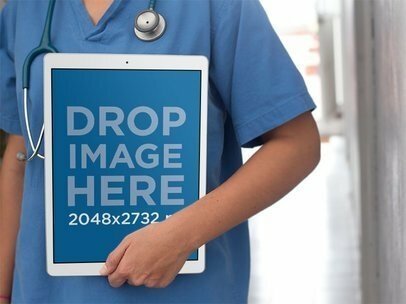 Make your strategy with high-quality assets and impress your clients instantly with this photorealistic digital mockup of a doctor holding an iPad Pro. Don't forget to check out this amazing Guide On iPad Mockups! App marketing has never been so easy! Placeit has all the best digital mockups to feature your latest app work in a more realistic way, take this mockup and customize it now by simply adding one of your own images featuring your app and our mockup generator will have your download in no time! Replace Photoshop with this great mockup tool and start saving on your strategy right away. White iPad Physician. Create app screenshots. This mockup will put your product screenshot into a physician&#8217;s office. Your target audience could be anyone to do with the medical field. This large, white iPad stage is portrait oriented and 768 x 1024 px. It sits on a small dark blue table surrounded by medical instruments. In visual range are a stethoscope, auriscope, and a tuning fork. To the right of the iPad is a gridded notepad where the doctor, wearing scrubs, is beginning to take notes. Can you imagine your new medical app in this awesome iPhone mockup? Simply drag and drop one of your own images now and you'll have a download ready in no time. Create more digital mockups like this one and captivate your users, they will love the authentic feel in your visual assets. Use iPhone mockups to promote your app and save money at the save time! Start promoting your health app with photorealistic mockups and save both time and money. This great mockup features a MacBook being used by an elder doctor at a hospital. You can add your image over the placeholder and our mockup generator will do the rest for you. Create your own advertising thanks to Placeit's easy to use templates! Take your new app to the next level! 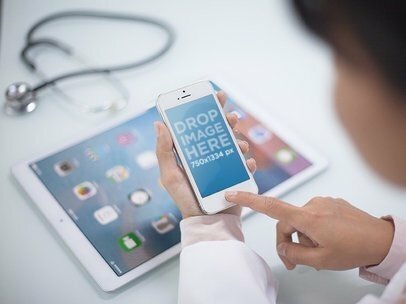 You can simply add one of your images over the mockup template of a doctor pointing to his iPhone 6 held in frontal view, cool shot right? Your app will look very professional in this awesome realistic digital template, go ahead and try it out! You are about to save both time and money with this incredible mockup tool. Check out this great iPhone mockup featuring a doctor outside a hospital browsing through his iPhone, this is just the mockup you need for you latest health app don't you think? Display your app work on this photo mockup in just seconds by adding one of your images over the mockup template, our mockup generator will take care of the rest for you! Use app mockups to promote your new app in an attractive way, you can personalize this mockup now by simply adding one of your images over the placeholder, a download will be ready for you in seconds! 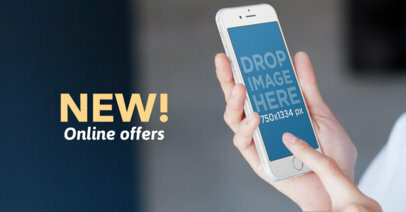 Try mockups for a change and boost your app marketing strategy in no time, see for yourself now and customize this great mockup featuring a doctor holding an iPhone in frontal view. Your health app is going to need this awesome photo mockup of a white iPhone in the hand of a medical assistant. Customize it instantly thanks to our great mockup tool, saving you both time and money by simply adjusting your image into this iPhone mockup. Go ahead and drop your image over the placeholder to see the result! Give your new app a fantastic visual asset to promote itself with our easy to use mockup generator. All you need to do is add one of your images over this mockup template featuring a doctor pointing at his iPhone in portrait position, you health app will look incredible! Try it out now and see for yourself why Placeit’s mockups are the best. Update your app marketing strategy with new mockups! Customize this health app mockup for your latest work, it features a doctor pointing to his white iPad mini in frontal view with a pen, great shot right? All you need to do is drag and drop an image over the placeholder and our mockup generator will adjust it for you to fit perfectly into this iPad mockup. You can promote your app with this best visual assets thanks to Placeit! Imagine how great your new app will look like in this great iOS device mockup! You can try out this iPad mockup now by adding an image of your choice over the placeholder, our mockup tool will adjust the content to fit the scene perfectly. Launch your health app with the best visual assets made possible by Placeit! Do you have a new health app you want to showcase? 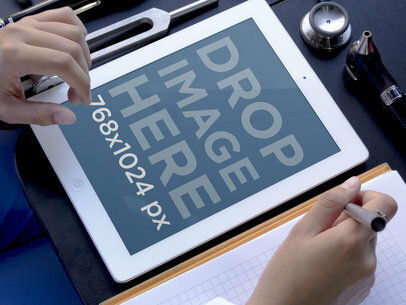 Try this cool mockup of an iPad Pro being used by a doctor, a very professional scenario to display your latest work. It doesn't get easier or more realistic than Placeit's mockups, find different scenarios and devices to promote your app with, you just have to drag and drop your image over the template of choice and ready! Launch your health app with the best visual assets possible thanks to Placeit’s super easy mockup tool! Drag and drop an image of your choice over the placeholder of this iPad mockup and our generator will have your download ready in just seconds, easy right? Create more digital mockups in no time and save money while boosting your app marketing strategy! Use this black iPad mini mockup to display your latest health app in a more realistic way! This context offers a doctor using his iPad to take note of a patient, cool shot right? Simply drag and drop your image over the mockup template now and our mockup generator will create your mockup in no time. Start saving up on money from your budget with the incredible digital mockups! Display your new app work on this great digital mockup featuring a doctor holding his iPhone in portrait position while taking note. You can find more iPhone mockups in our great collection of customizable mockup templates, all you have to do is drag and drop and your mockup will be ready in no time! Make your marketing strategy easier and more attractive when you start using mockups to promote your work! This mockup will put your product screenshot into a physician&#8217;s office. This large, black iPad stage is portrait oriented and 768 x 1024 px. It sits at a right angle, on an off-white table top surrounded by medical instruments. Above the iPad is a stethoscope. To the left of the stage is a auriscope and a ophthalmoscope. The doctor is holding a buck hammer in his left hand while interacting with your screenshot with his right. A stack of reference books sits to the upper right of the screen. Your target audience could be anyone to do with the medical field. Showcase one of your latest apps with digital mockups! You can create your own branding campaign thanks to our easy to use mockup generator. 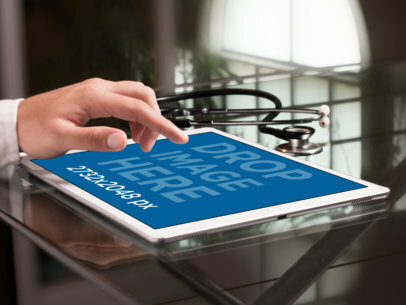 Try out more of our photorealistic mockups from our wide variety of mockups like this one featuring a doctor holding a white iPad mini pointing at it in portrait position. Give it a try by placing your image over the mockup template and you'll have a download ready in no time! Don't forget to check out this awesome Guide On iPad Templates! Customize your own digital mockup in a few seconds thanks to this cool mockup tool! You can stop struggling with Photoshop and start promoting your new app the right way with these photorealistic iPhone mockups, try it now by adding your new app design over the placeholder and our mockup generator will do the rest for you, isn't that easy? Your app is about to look so much better in this incredible realistic iPhone mockup featuring a doctor holding a white iPhone 6 in her office. Try out your latest medical app on this great photo template and amaze your clients at a glance. You can add your image over the placeholder and our mockup generator will have your new mockup ready in just seconds so you only have to download! Use digital mockups to create realistic visual assets for your app marketing strategy! 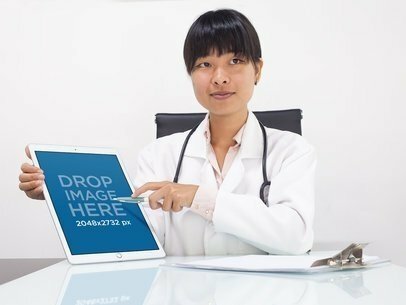 You can display your latest medical app on this great mockup featuring an iPad Pro held by a doctor in her hand and pointing to it. Get more out of your budget with this mockup generator and impress your clients at a glance! Start promoting your new iOS app with Placeit's mockups.